Do you have a unique furniture need or an idea for a one-of-a-kind cabinetry system? You’re in luck, because at ABEL Corp. we take pride in turning original ideas and specialty designs into reality. In fact, nearly every project we do is custom—that’s the nature of premium millwork and cabinetry. Contractors, architects, and builders choose ABEL Corp. for all sorts of millwork and cabinetry projects because of our ability to meet timeline and budget demands regardless of type of product that needs to be built. 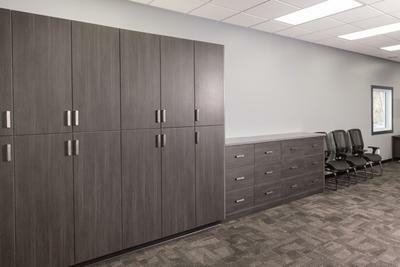 From conception to installation, ABEL Corp. is your partner when it comes to custom millwork and cabinetry. It’s great if you come to us knowing exactly what your project consists of, but we also offer in-house design and consultation services that can help you solidify your idea. And with each project we provide a full set of comprehensive shop drawings to ensure accuracy and provide a clear understanding of the scope of the project. One the design is established, we then discuss timelines for production, delivery, and installation so you can plan accordingly on your end. Our state-of-the-art manufacturing facility is staffed by some of the most experienced craftsmen in North America who are trained to use the most cutting-edge tools and equipment. What does this mean for you? It means that we can bring any custom design to life, regardless of how big or complex. In fact, we take pride in saying “yes” to designs that other manufacturers turn down. ABEL Corp. has a singular driving mission: complete and total customer satisfaction. To that end, we’ve always done whatever it takes to help customers who come to us with unique needs and non-standard demands. We’ve been designing and building custom furniture and cabinetry as long as we’ve been in business. With more than 20 years of experience under our belts, you can have all the confidence in the world in our ability to turn your vision into reality and meet your very unique and specific needs. We would love to hear from you and learn more about the custom furniture or cabinetry system you have in mind. The consultation is free, and so is the budget estimate, so you have nothing to lose by contacting ABEL Corp. today. Contact us online or call (877) 440-2235 to get started. Contact the sales team for a consultation on how we can help with your project at 1-877-440-ABEL.